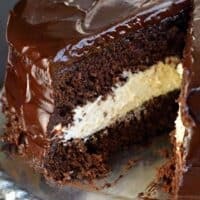 This Copycat Hostess Ding Dong Cake recipe is a rich, decadent chocolate cake, with a creamy filling and chocolate ganache spread over the top! I wish I could apologize for today’s chocolate insanity, but I’m not sorry. Sometimes you just need a little comfort food to get you through the day, the week, the month, the year. Am I right? Growing up my mom would buy us Little Debbie snacks and Hostess snacks for our lunch boxes. We never knew what she would come home with, but I always got a little giddy when a box of Ding Dongs were in the cabinet. Tell me you remember these treats? Honestly, they tasted just like HoHo’s but a different shape. 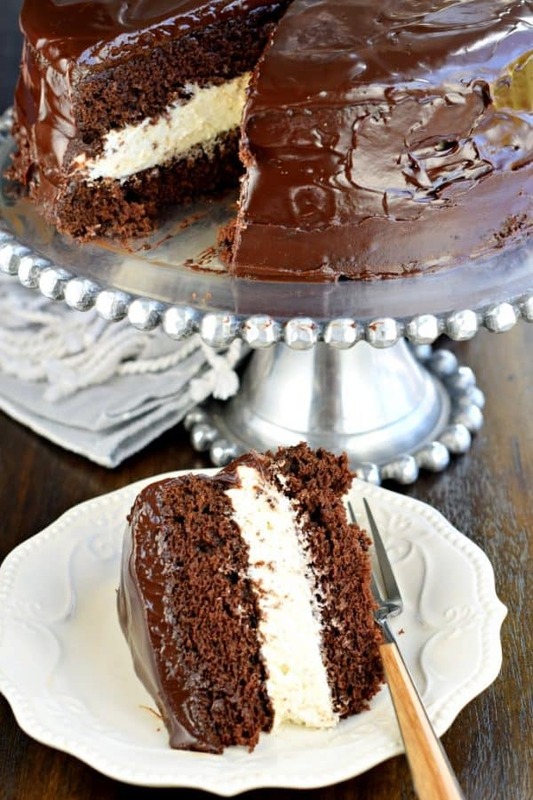 Two layers or chocolate cake with a cream filling, all coated in chocolate. Look familiar? Today’s Ding Dong Cake is just that, only….bigger! 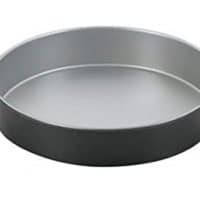 Start by baking up two 9-inch chocolate cakes. 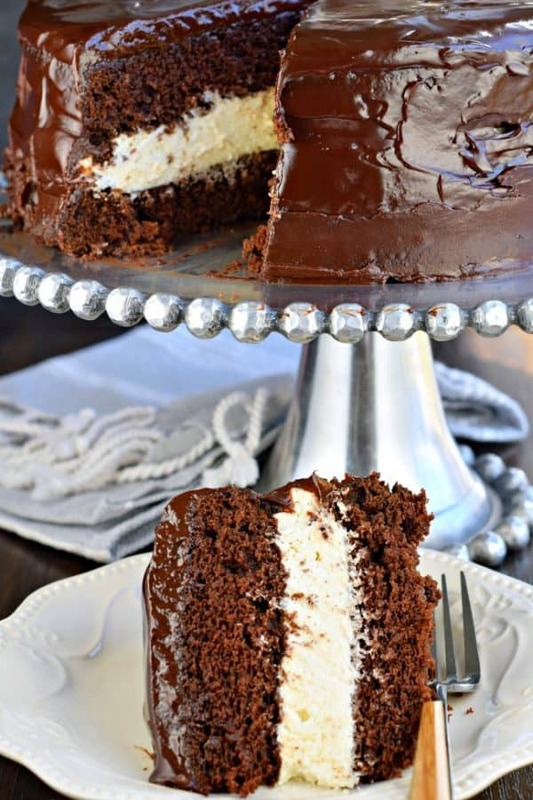 I used my favorite chocolate cake recipe for this, so fudgy and perfect. If you choose to go with a boxed mix, make sure it’s a rich and fudgy version, like a Devil’s Food cake. Next you’ll make the cream filling. It’s a less sweet buttercream frosting, sometimes called Ermine frosting. A friend at our old church called it boiled milk frosting. But I think that sounds gross, so let’s call it cream filling. You’ll first put your cold milk and flour in a small saucepan and whisk until the lumps are gone. Heat this up until thick, stirring the whole time. You want to keep stirring and heating until it becomes thick, almost like pudding. Be patient. 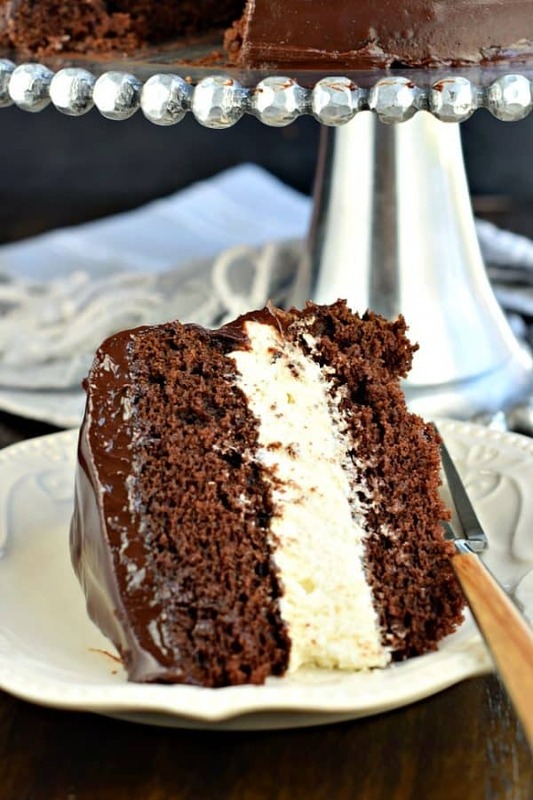 Spread this thick layer of cream filling between your two cooled chocolate cake layers. Whip up some chocolate ganache and pour it over the top and sides. Allow it set, and enjoy. These Flourless Chocolate Cookies are a chewy cookie with a crunchy topping! You’ll love the rich chocolate flavor in a unique cookie! Move over Starbucks, we’ve got a copycat recipe on our hands! The BEST Red Velvet Cheesecake Cake recipe starts with two layers of homemade red velvet cake with a layer of cheesecake in the middle. 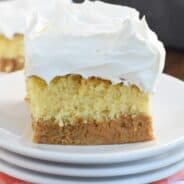 Topped with delicious cream cheese frosting and white chocolate curls! In a glass bowl (safe for the microwave) combine semi sweet chocolate with heavy cream. Heat for 1 minute. Remove from microwave and stir until smooth (you may need to heat for another 15-30 seconds). Do not over heat. 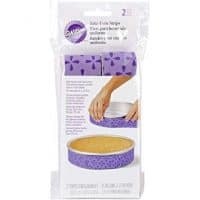 Set aside while you begin to assemble the cake. Slowly pour the ganache over the cake, using an offset spatula to help cover the top and sides. Allow to set, about 15 minutes. Slice and enjoy! I think i just drooled on my phone!!! Thanks. This is 1st on my list for this weekend. Yummy. This looks over the top good! 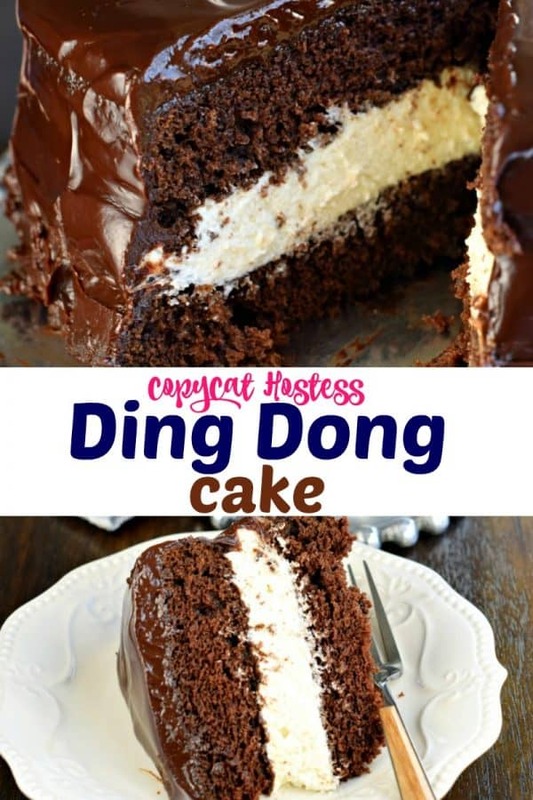 I used to eat so many Ding Dongs as a kid…wow, this looks 1000x better! I wantbto use thie cake recipe for cupcakes. What would be tge bake time? I was very intrigued by this cake, especially the filling. 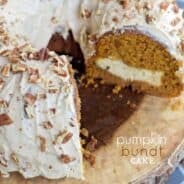 I made it this weekend and was absolutely amazed at how delicious this cake is! The chocolate sponge is soft, airy and moist, the filling has the right amount of sweetness and the combination of the two is perfect. The ganache icing/topping works really well with the cake too. My advice is don’t hesitate. Make this cake; you’ll be glad you did! Hi there. We do not drink coffee, so I’m not able to use that ingredient…do you have any suggestions for what I can substitute? Just a couple of things… I continued to mix the cream filling as stated but it still looked a little curdled but tastes fine. I chilled the cream filling until slightly firm and used a pastry bag to apply to the cake. Also, on my first attempt I merely sprayed the cake pans like recommended but the cake stuck to the pans horribly. Second attempt I used a flour and cocoa mixture to “flour” the pans after spraying and the cakes came out fine. Using parchment paper would probably work too. It is also best not to put the chocolate chips in the microwave but instead merely heat the cream and pour over the chocolate. My chocolate chips did NOT like being microwaved even for the initial one minute. This cake has a VERY deep/dark chocolate taste. A lady at my office begged me to make this cake for her after seeing this recipe on facebook… so I hope it is well received! The name of this intrigued me, we don’t have anything called ding dongs here in Australia so I didn’t realise it was a lunchbox treat. This cake looks totally fabulous!!! Hi.. How long in advance can I make this.. and does it need to be refrigerated while waiting to be eaten? 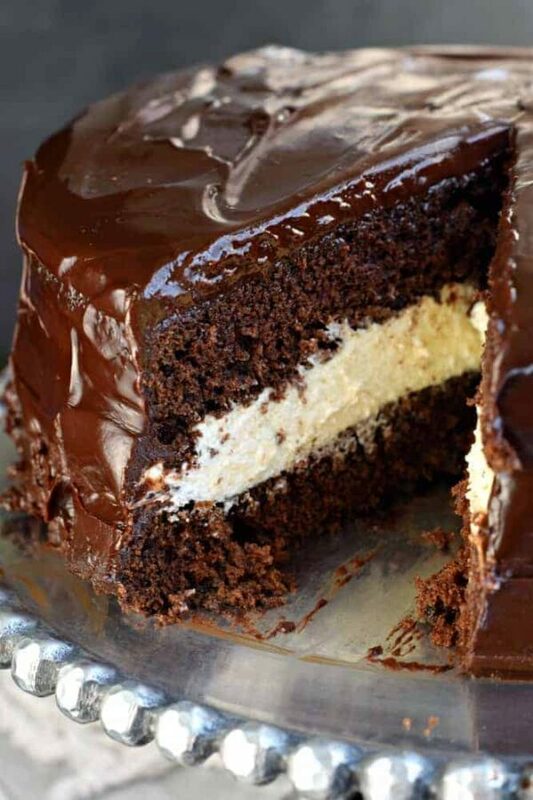 Huge party this weekend and would love to add this..
Made cake as recipe described. The cake was really sweet and ganache was thin. My husband and I did not like cake. Darn, tried to rate this but somehow I deleted a star! It should be a 5 star review!!! Easy to prepare and oh so good! Made this cake…turned out nice …i am still left with the cream filling…how long can i freeze it and use it again…as dont have any plans to bake for sometime now.. I made this as a birthday cake for a friend. This was a huge it and I would recommend this recipe and have already shared it with family. When I make my gobs I use boiling water, could I do the same instead of the coffee? Cannot wait to try it!! Made the cake, it was great. The cream filling never came together correct for me, so I subbed heavy cream & confectioners sugar. It was ok. The ganache turned out well too. So all in all, I’ll probably make it again & tweak it a little. I am confused because in the video of ding dong cake, oil was added? But in the written recipe there is no mention of oil. Please can you clarify? I made this tonight , the cake was dry, the filling turned out awesome but found that the ganache was too sweet for me. i will try making it again but with a few modifications. 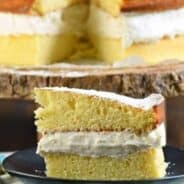 I will be making a champagne cake for my daughter-in-laws Birthday- I was thinking of using the Ding Dong cake cream filling between layers and a buttercream frosting- what do you think? Please help. I’m making the cake today and it’s turning out great except for the ganache. I chilled it for awhile and it’s still running off the cake. Your cake is beautiful with the ganache covering the sides. Mine is covering the cake plate. Right now I have the ganache and the cake chilling to try again. Any suggestions as to what I’m doing wrong. Thanks so much.